You will look great in your bikini with nice tight abs. Imagine yourself walking down the beach in your new string bikini, all eyes on you. Tight, toned abs tend to draw attention. But there are other great reasons to keep your abs strong, such as maintaining good posture and preventing lower back pain. Start an ab workout on a stability ball, which is good for improving strength, agility, flexibility, balance and core muscles. An intermediate exercise is called the Pike. You lie on the ball in a pushup position with the ball under your thighs. Keep your spine straight, and hold this position. Once you feel confident doing this, you can challenge yourself by flexing your spine and hips slightly and rolling the ball forward. Then roll it backward to the starting position. Easy enough, so have fun. Pilates may look easy, but don’t be fooled. They help increase core strength and stabilization. The One-Legged Bridge is a Pilates move that works the core muscles. Lie on your back on the floor with your arms at your side. Start with your knees bent and feet and legs at hip width. Raise one leg so the calf is parallel to the floor and the knee is at a 90-degree angle to the hip. While exhaling, raise your pelvis until only your shoulders are on the floor. Hold this position, then while inhaling, straighten the raised leg. Return your leg to the bent position while exhaling, then lower yourself back down while inhaling. Try this a few times and see how those abs feel. The heel-on-toe crunch works out the upper abs. Start by lying on your back with your legs straight and your knees unlocked. Put your left heel on top of your right foot. With your left hand behind your head, lift your right arm straight up from the shoulder. Then curl up, making sure to raise your head, neck and shoulders off the floor while contracting your abdominals. You can do a few of these, then switch to the other side. The lower abs can be targeted with this move using a step platform. Lie flat on the platform with your knees bent and your arms over your head holding onto the step. Keeping your back flat, lift your tailbone off the step while contracting your abdominals. After a few of these, you might almost be ready to take two aspirin and call your doctor. The abdominal muscles are part of your core, and there are all kinds of exercises to strengthen them. 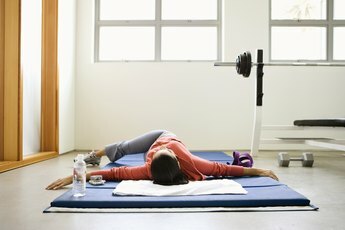 Keep in mind that proper technique is essential for the best results and to prevent injury. You may want to consult a trainer when starting out.